This is celebration of design. Pamätám si, keď som videla kolekciu Melissy prvýkrát. Bola to prezentácia Anglománie na Designbloku v Prahe, v roku 2009. Jeden pár som musela okamžite mať. Do dnešného dňa ma Melissa neprestáva fascinovať svojou rozmanitosťou, farbami a designom stále nových prichádzajúcich kolekcií. Melissa oslavuje už 33. rok od vzniku tejto celosvetovej známej značky, na ktorej kolekciách sa v minulosti podieľali veľké osobnosti ako napr. Louis Vuitton (r. 2007), Chanel (r. 2012), Marc Jacobs (r. 2006), Armani (r. 2012), Madonna, Vivien Westwood a mnoho ďalších. Všetky tieto mená znamenajú kvalitu, luxus a hlavne – high fashion. I remember when I saw the collection of Melissa for the first time. It was the collection Anglomania by Vivienne Westwood at Designblok in Prague in 2009. One pair of shoes of this amazing collection I had to have immediately. Until today Melissa continues to fascinate me with its sence of originality, diversity, colors and design with always new inspiring collections. Melissa has celebrated its 33 years since the inception of this world famous brand. Collections created by great personalities like Louis Vuitton (2007), Chanel (2012), Marc Jacobs (2006) Armani (2012), Madonna, Vivien Westwood and many more paid their tribute with their contribution. All of these names represent quality, luxury and fashion of its finest. Pre leto 2013 navrhli úžasné kolekcie pre Melissa Rainbow - Pedro Lourenco, J. Maskrey, Gareth Pugh, Jason Wu, Campana … . Kolekcia Rainbow je (ako inak) inšpirovaná farbami dúhy, slnkom, letom, priateľstvom a hudbou. Pre jeseň a zimu 2013 pripravuje kolekciu sám veľký Karl lagerfeld. Nebude chýbať zlatá, zmrzlina a elegancia. Prečo milujem Melissu? Pretože je iná – jedinečná, hravá, voňavá a farebná. Nemôžete si ju nikdy spliesť s inou značkou a stačí jediný pohľad, aby ste poznali, že je to Melissa. Ak budete mať niekedy príležitosť navštíviť New Yorkskú štvrť SoHo, určite sa nevyhnite galérii Melissa, kde sa stretáva na jednom mieste móda, s designom, umením a architektúrou. Ako sa vám páči nová kolekcia Melissy? 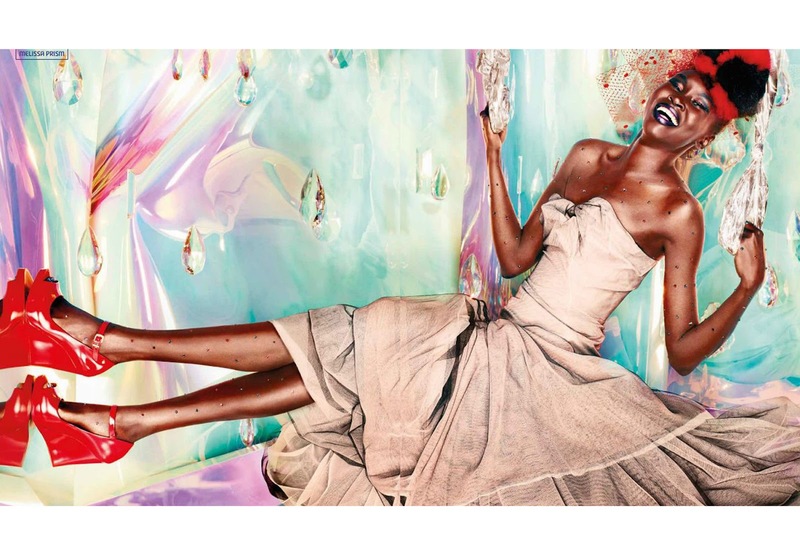 The summer 2013 Melissa Rainbow collection is designed by combined efforts of the following designers - Pedro Lourenco, J. Maskrey, Gareth Pugh, Jason Wu, Campana ... . The Rainbow Collection is inspired of and based on the colors and senses of a rainbow - sun, summer, friendship and music. The fall and winter 2013 collection prepares great Karl Lagerfeld himself. I certainly will not miss to see the expected gold colored and ice-cream-designed heels combined with a lot of elegance. Why do I love Melissa? She is definitely different, unique, play and colorful. You will always be able to easily and unmistakably identify the just one look of Melissa shoes. If you will ever have the opportunity to visit New York's district SoHo, be sure to visit the Melissa gallery, a wonderful place, where fashion, design, art and architecture unit just wonderfully. Do you like the new collection of Melissa? WOW !! These heels are so good :) Designs look lovely Ema !! Milá Elizabeth. Tenhle článek byl připravovaný 2 měsíce před jeho zveřejněním. I love the Vivienne Westwood collections as well! I love VW, and with her collab with Melissa, I'm able to buy VW design at a price I can actually afford, haha. I have three pairs from the different VW x Melissa seasons, and I LOVE them. They're insanely comfortable and they smell like My Little Ponies. Lovely blog! Feel free to follow me and I weill follow back! Just let me know! kisses from Greece! Great post!! I love Melissa shoes! wow..beautiful collection! Love all the shoes! Thanks for sharing! Hope you are having a wonderful day! I love those red pumps! So pretty!